-- Get the next author. Testing that transactions do as they should is probably easiest done right in Sqlserver management studio. The trick is to fire up two of them. 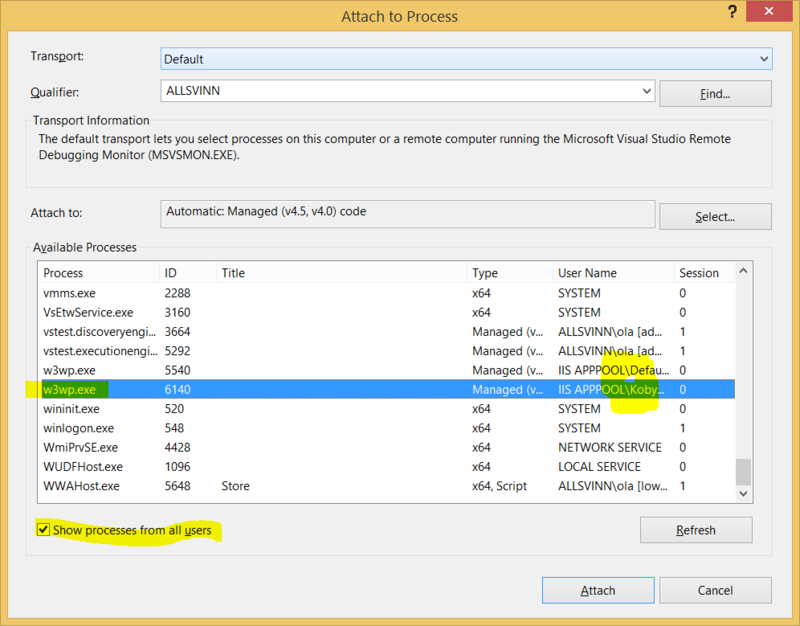 You can set breakpoints as with your usual Visual studio and use the same shortcuts for stepping through. Transactions are complex, do not think otherwise. Similarly to multi threaded programming it requires knowledge beforehand and just not the usual intellisense-and-see-which-methods-pops-up we have learned to use. Playing around with transactions before implementing them is crucial for understanding and correct behaviour. Just understanding that the transaction does what it should is probably not enough for any solution that has more than a trickle of traffic. Resources I have used a lot are Inside Sqlserver and Sqlserver Books online (BOL). The latter is the same as the help. Honour those who should and here. For example when one restores a database one has to disconnect all users. Here is a script for that. I recently forgot to close the connection and looped through records so the connection pool was exhausted and people couldn’t log on to the system. Typically something one finds out in a live system where many use your web at once. At least that was the case for me. Below is the code I ran over and over again while looping to make sure my updated code didn’t use too many connections in the pool. There is also a longer version of the latter here. I don’t know for how long this has been possible but I guess my years of whining about lack of data scripting capabilities in Sqlserver management studio is moot. I found an article which describes the hidden setting. I wonder for how long the possibility has been there. I remember Sqlbase scripting its own data back in last century. I remember myself writing sprocs for the same for Sqlserver. I remember myself hunting scripts for the same on the web. I now foresee a future with lots of clicketyclick – the GUI of MS’s Sqlserver tools is way too fiddly for my taste. CREATE ASSEMBLY failed because method ‘…’ on type ‘…’ in safe assembly ‘…’ is storing to a static field. Storing to a static field is not allowed in safe assemblies. When working with CLR inside the SQLserver database one doesn’t have to deploy the DLL through Visual Studio. Instead use the Create Assembly command. CREATE ASSEMBLY failed because method 'AAA' on type 'BBB' in safe assembly 'CCC' is storing to a static field. Storing to a static field is not allowed in safe assemblies. CCC is the assembly that refuses to install. Find AAA. Rewrite to be not static. Compile. Run create assembly again. It is, at least in MSSqlserver, possible to annotate fields. Please do. There are people coming after you to maintain the code base. One day it might be you who come after someone. Start paying it forward. The field explanation might be in the Documentation but the Documentation is too often faulty, not accessible and almost always not up to date. The database is closer and probably easer to keep in sync with reality. Don’t think a field name is self explanatory. The field CustomerID in table Customer might be. But the same field in Region is not. Is it the region master or the primary customer or what? By the time the field was created the meaning of this field was clear but not a year afterwards. The reason I write this is that I presently work in a project where the habile predecessor has written down the meaning of the fields and saved me lots of time and lots more of confidence of what the figures mean and tons of debugging time. If one uses trusted connection to a sqlserver database under Windows 7 and II7 one might get the error message “Login failed for user ‘IIS APPPOOL\DefaultAppPool’.” when trying to run a web application. 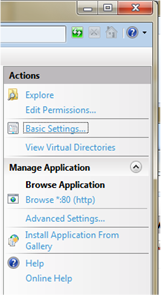 There are several articles for this but all points to a different GUI than mine (earlier versions of Windows7/IIS7?). Update: as I lightly noted, to give the apppool SystemLocal rights is Not the right way to go. 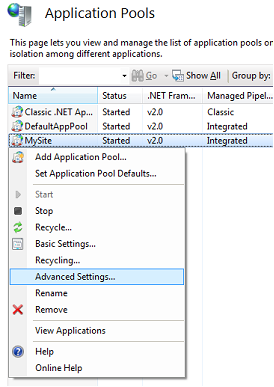 Find the Application Pools item in the Connections toolbar. 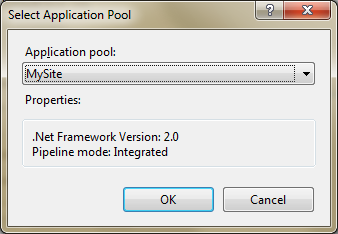 One can reuse the default application pool or create a new one. Go for the latter since it is slightly more complicated and hence more fun. 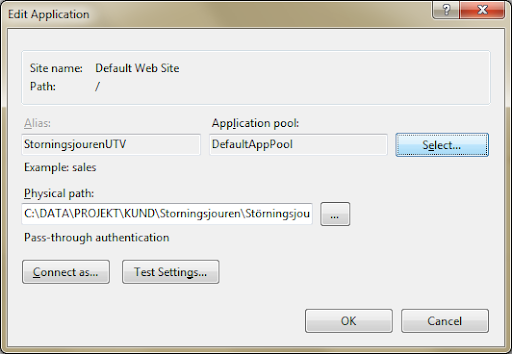 Select your newly created application pool and the advanced settings. Change the Process model to LocalSystem. Update: Don’t change to LocalSystem, instead add the user to allowed SQLServer logins as noted in the bottom here. 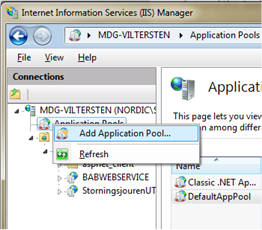 I suggest “IIS AppPool\MySite” for now. The recommended Microsoft solution is to create a separate account. However, if your solution is small, you can instead add the ‘IIS APPPOOL\DefaultAppPool’ user as a database user in your SQL instance, then providing the proper ‘User Mappings’ to the databases you need the DefaultAppPool user to access. You may not necessarily be able to search for this user, but you can still enter it in the ‘Login name’ field in the “Login – New” window as “IIS APPPOOL\DefaultAppPool” (without the quotes). 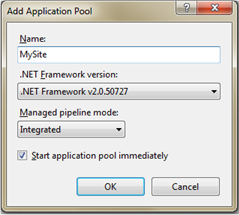 Now change your web application to use this application pool. This could be made simpler by moving the menu for this to the same place as the other menus. To make the story short – select your site and look to the right of the IIS manager. To add a new user to SQLServer go to your database->security and add user connected to IIS APPPOOL\DefaultAppPool. This way the user can log in to the database. New login to database. Don’t forget to change default database to appropriate. Then go to the SQLServer->security and add this user to be allowed to login to the server through the user and properties. The users of a database.